Actually i wanted to share Karnataka style Holige as Varamahalakshmi festival recipe. 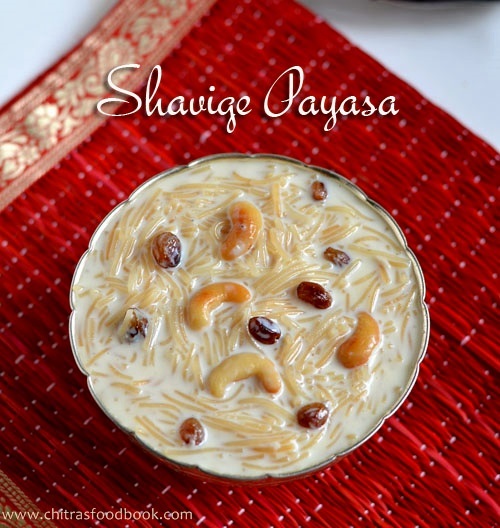 But unfortunately i couldn’t make it as i expected.Next to holige,people in Karnataka make this shavige payasa for most of the festivals.So i thought of posting this simple and quick fix dessert recipe, vermicelli kheer on this auspicious day.In Tamil nadu,we make Paal payasam aka semiya payasam in a similar way but we make it slightly watery in drinkable consistency.But here,people make it like vermicelli pudding in thick spoonable consistency.U can make it rich by adding condensed milk(milk maid) or khoya.Lets see how to prepare this droolable shavige payasa . Wish u all a very happy Varamahalakshmi festival.May we all get the blessings of Goddess Lakshmi on this wonderful day . Heat 1 tbsp of ghee in a pan.Roast cashews & Dry grapes.When grapes turn bulgy,remove & keep in a plate. 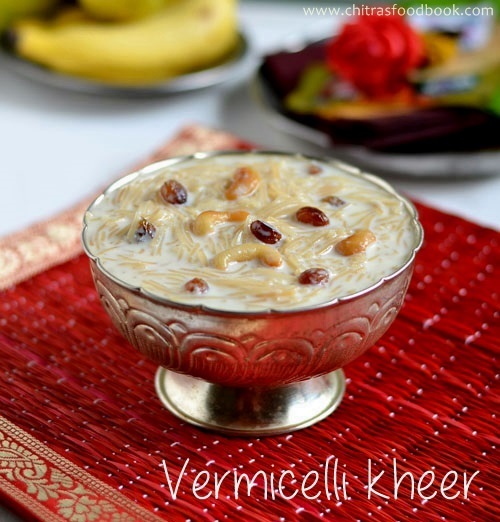 In the same ghee,roast the vermicelli even if its roasted.It will enhance the taste. Boil 1 cup of water + 1 cup of milk in a wide bowl.When it comes to boil,add vermicelli.Let it cook in low to medium flame.After its well cooked,add sugar. Mix well and boil for few minutes till all the sugar dissolves.Add the remaining milk & MTR powder if using.Boil for few minutes. Lastly add cardamom powder,roasted cashews & dry grapes.Switch off the flame.This payasa will thicken once its cooled down.So adjust the quantity of milk. Refrigerate,cool n serve OR serve warm as u like. Adjust the quantity of milk as per the desired consistency. U can also add 2 tbsp of condensed milk or khova to get a rich taste. In that case reduce the quantity of sugar. Adding MTR badam powder is optional.But i have tasted in some of my friend’s houses.It tastes great with a nice flavor. wow! Super payasam chitra. I can have it any time. looks tooo good. Am ready to finish that whole bowl rite now, payasa is just inviting me. Looks creamy and yummy...... Love the last click!! Thank you Chitra for stopping by my blog.I have been eyeing on the chocolate u made some time back shd give it a shot . Payasam looks awesome. 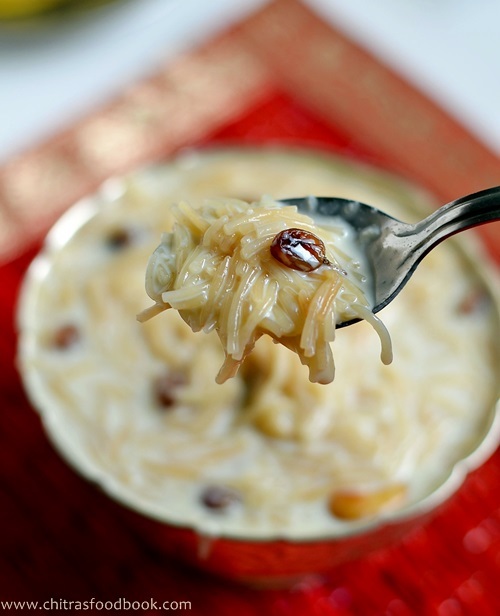 This kheer is made in the similar way by Sindhis and Punjabis !